Hi! I'm Greyson! As you can see I'm a kitty but I'm so special that Summit Dog Rescue voted to put me on the Doggie Page! 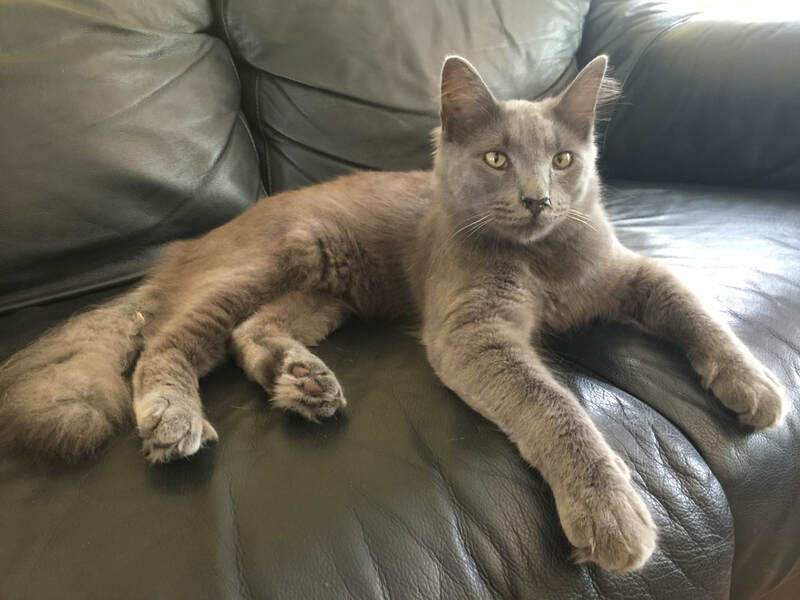 I'm a 9-month-old Russian Blue / Ragdoll kitty, which makes me regal, velvety, affectionate and actually quite handsome -- at least that's what everybody says. And the Ragdoll part of me LOVES people and gets along well with other animals. But all I know is I'm a bundle of fun and gorgeousness -- Cover of GQ, maybe? A nice person found me far away but then I was brought here to Colorado, and I love it here! My soft grey coat just begs for snuggles with you on the sofa, and my Hobbit toes with fur growing in between them are my best feature. They're my home-grown kitty socks to see me happily through the winter's snows up here in the mountains! Not only that, but I'm already neutered, and best of all, I'm house-trained! My cool foster mom has tons of awesome dogs and cats to make my days really fascinating and fun. She's finding out that I'm super smart, friendly beyond words, snuggly and playful! I'm cool with easy going dogs, but I mostly adore people. Can I stand on your keyboard while you type? That would be fun! Summit Dog is learning more about me every day, and soon there will be more info here. In the meantime if you want to find out more about me, send an email to summitdogrescue@yahoo.com. A nice volunteer will get back to you as soon as they can.